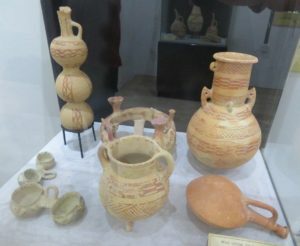 The Saint Barnabas Icon and Archaeological Museum in Northern (Turkish) Cyprus houses many beautiful artefacts: especially pottery dating from 2300 BC till 475 years BC. It was a pleasure to walk through the two different exposition rooms. The icon part of the museum is disappointing; rather new (19th/20th century) and mostly bad quality. But I do recommend a visit to other parts! 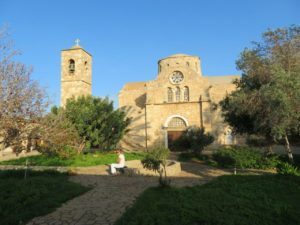 Next to Saint Barnabas’ grave lies a (former) monastery – the last monks left in 1977. 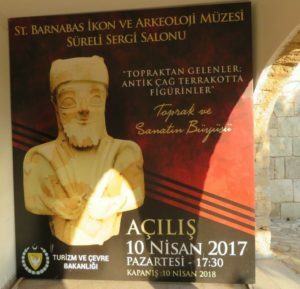 Nowadays it is the residence of the Saint Barnabas Icon and Archaeological Museum: the banner above this blog notices the opening in 2017 but I remember a visit in the ’90ies when both icons and archaeological artefacts were already exposed. Most probably a more formal status was given to this place to attract more attention and thus visitors. 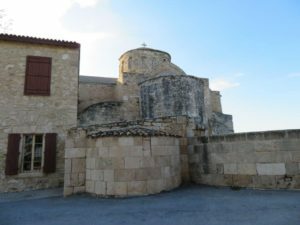 You can enter through the gate where you pay a small entrance fee and find the church of the monastery immediately on your right hand. It houses the Icon Museum but that is not an interesting place to visit. There are no valuable old icons and the quality of the icons is poor. 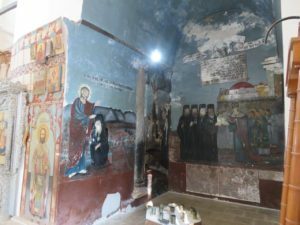 It looks as if the Turkish-Cypriot government didn’t know what to do with the church and some icons found and decided to combine the two into a museum. 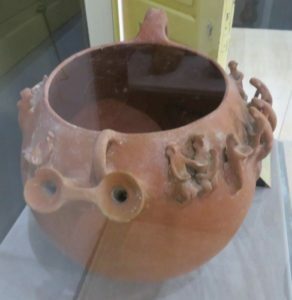 And then this pottery: how can I describe it? The sign says ‘white painted ware and red-on-red flask, early bronze age 1900 – 1625 BC’. The description does not do justice to the originality and variety in shapes. Endless is my admiration for the artisans who made this in a period when they had ‘nothing’ compared to the instruments and techniques we have. 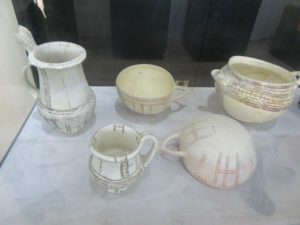 Late bronze age pottery – 1450-1225 BC: amazing in its simplicity. Or is this late bronze age design? Amazing…. 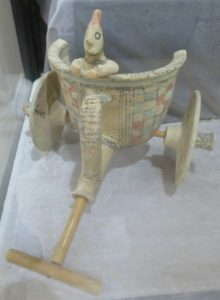 I adore the warrior in this chariot: although he seems to be too small for the size of the chariot, he looks proud and confident. 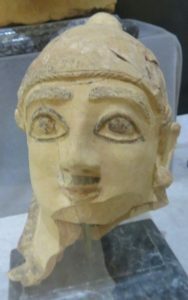 This is just one of a collection of very special terracotta figurines in this museum, from the archaic period 750-600 BC. The Archaeological Museum is worth a visit, even though the Icon Museum is disappointing. You can combine it with a visit to Saint Barnabas’ grave at immediate walking distance, and to the nearby Royal Tombs.